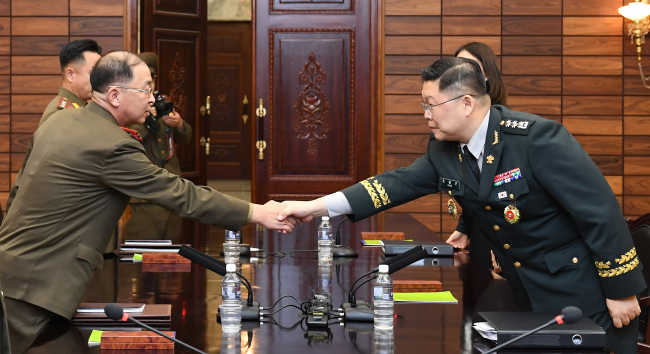 With the leaders of the two Koreas seeking to take significant measures to ease military tensions during their summit next week, the two sides’ militaries held extensive discussions to facilitate the upcoming meeting. During the 17-hour talks that started Thursday morning at the truce village of Panmunjom, the two sides sought to pave the way for a third meeting between President Moon Jae-in and North Korean leader Kim Jong-un in Pyongyang. While no specific agreements have been announced, the government said Friday both sides exchanged their views on how to work out out an agreement to implement military part of Panmunjom declaration made during the first summit between Kim and Moon in April. Through today’s discussion, the two Koreas’ militaries confirmed each other’s positions on what should be included in the agreement and adjusted the wording concerning the relevant document,” the Ministry of National Defense said in a press release. In the declaration, the two Koreas agreed to cease “all kinds of hostile acts” against each other “in every space” of land, sea and air. To prevent accidental skirmishes, two sides stopped blaring propaganda broadcast across the border and pledged to establish a “peace zone” in the West Sea. During his meeting with an advisory panel for the Pyongyang summit on Thursday, President Moon said his trip focuses on “bringing an end” to accidental skirmishes and lingering tensions in the border region with North Korea. The two Koreas have engaged in exchanges of fires along the heavily-fortified Demilitarized Zone and the cross-border area of the West Sea, such as the 2015 artillery exchanges in the western part of the DMZ and North Korea’s shelling of South Korea’s Yeonpyeongdo in 2010. “What we need right now is to eliminate the possibilities of military clashes and tensions between the two Koreas,” said Moon, stressing that his top priority is reducing the risk of conflicts surrounding land and maritime borders with North Korea.